I believe artists should not be content with the specific subject matter in which they excel, or with the specific process they have mastered, merely to repeat themselves within an established style. I feel artists should be sensitive to changes around them and, like scientists, be constantly exploring, experimenting, discovering, and developing new concepts, ideas, and ways of expression. Picasso found inspirations in African Art. Matisse underwent the influence of the Orient. In light of the shrinking time and space, there will be more interpenetration and integration of art forms of various cultures. 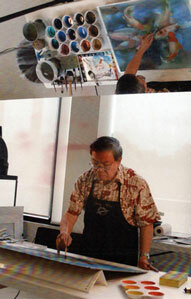 As watercolorists, we should be aware of the rich East Asian watermedia traditions. I am fortunate to have grown up both in the East and the West, and both experiences and influences have shaped my artistic career. I paint in both Western and Eastern approaches, but more importantly, I have been constantly searching for ways to synthesize the two. I feel the purpose of a workshop should be for artistic enrichment, creative rejuvenation, and spiritual renewal. Through group dynamic and fellowship, it ultimately contributes to individual growth. In conducting a workshop I consider myself the coordinator of a learning program in which artists share their creative ideas and processes, and provide stimulation and support to each other. As a coordinator, I share all my creative experiences with the participants, but will not impose my personal viewpoints upon them. I will explain the philosophy and principles behind my creativity, demonstrate my various concepts and process, instill design principles in pictorial organization, help sharpen perception of abstract qualities, explore the possibility of synthesizing the East and West approaches, and more importantly, guide the participants to develop in their own directions. I believe an environment that is conducive to learning is the one that stresses flexibility, fun, fellowship, and the spirit of caring and cooperation. 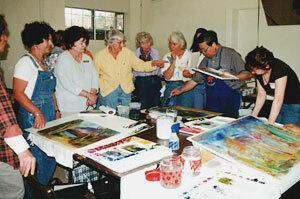 The workshop schedule will include: 1) Traditional approach, 2) Saturated wet process, 3) Improvisational approach, 4) Crinkling technique, and 5) Marbling and mono printing. I will begin each day with a demonstration to explain a different concept and process and then work individually with the participants as they apply the new experience to their own works. The exploratory nature of this workshop requires participants to work basically in the studio. Therefore, they must bring their sketches and reference material for each day’s project. A new concept or process often takes an artist a long time to develop and perfect. Even though some artists are able to do excellent paintings during the workshop, they should stress the process rather than product. They should try to thoroughly understand the process, work on it during the workshop and paint masterpieces in their own studio when they have more time to practice.